I love decorating. And it’s no secret, I adore Sarah and Sarah’s House on HGTV — and apparently I can’t stop talking about it. The new series just recently aired in the US has been especially inspiring me lately since I’m knee deep in so many home decor projects right now (I’m still watching the episodes since I saved them on my DVR!). Even though Sarah started with a $700,000 brand new house and a $100,000 upgrade budget, sigh, I think there are always plenty of inspiring and affordable principles to take aways from her style. Here are five Sarah’s House take-away ideas I especially love right now! 1. Use color and finishes fearlessly. One thing I especially appreciate about Sarah Richardson is her use of color and finishes. I am really enjoying how she brought color and a mix of finishes into this family home to give it a lot of zing and pizazz! 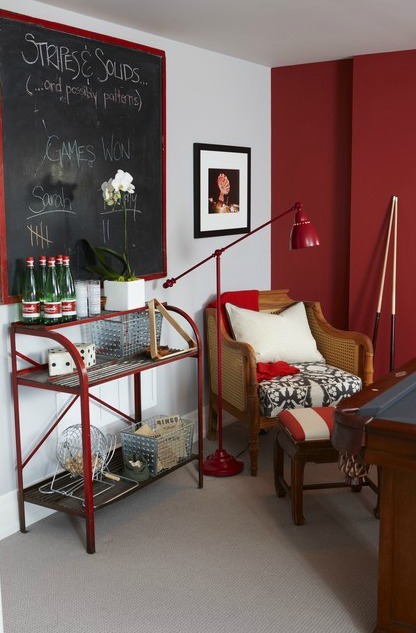 And I love how she paired the red with gray in this family space! Don’t let Pinterest or designers or bloggers or anyone tell you what colors or wood is in or out for YOUR home. Colors and wood can all be in, it is up to you how to use them in a way that shows of your style and makes the most of the home you have. You can mix any wood, finishes and colors to create a look that is entirely fashionable and 100% YOU. I love “outside the box” thinking. 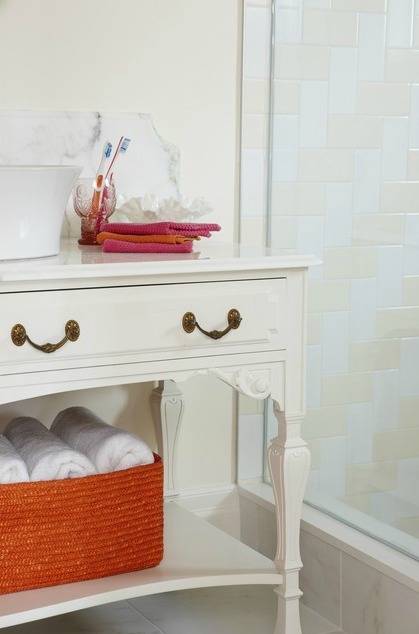 Rather than putting together a typical builder bathroom with stock cabinetry and mirrors, Sarah created this fantastic vanity out of a real piece of furniture. And the casters on it? A fabulous extra dose of personality and style. 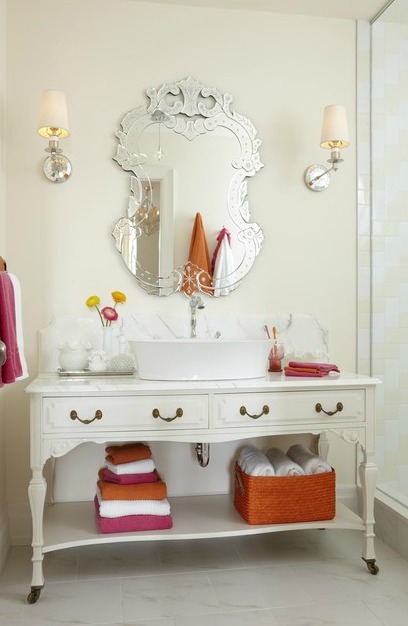 The stylish mirror, the bright pops of color and the fantastic sink take this bathroom from expected to WOW. 3. Design rooms you can really use. This craft room is amazing. I think in designing a home it is important to evaluate how you really live, how you will use a room and where day to day activities can take place. This craft room is so multi-purpose! It can be used by the entire family for everything from crafting to school projects and homework. It is well-organized and set up for maximum effectiveness. 4. Build in storage to every room. I love how Sarah addressed storage needs of the modern family in the family room. With IKEA cabinetry designed to look like custom built-ins, she created space to hide and stash all the electronic components and miscellaneous stuff that inevitably ends up all over the room. I am actually seriously considering creating a cabinet very much like this in my own family room. For a well-organized home you really need as much storage as you can get — so “custom stock cabinetry” is definitely on my wish list! 5. Give yourself a retreat. This bathroom looks like something you’d find in an luxurious boutique hotel. Can you imagine lounging in that tub? While my house is not that fancy, the idea of a retreat, an escape in my own home …. now THAT is an idea I really embrace. Creating a master bedroom or bathroom that feels like a getaway isn’t just for luxury estates, this is an idea you can translate even in the most modest of homes. Maybe start with some fluffy white robes, candles and why not a little bling with a crystal chandelier …. oh yes. I’m all about the retreat in my own home. 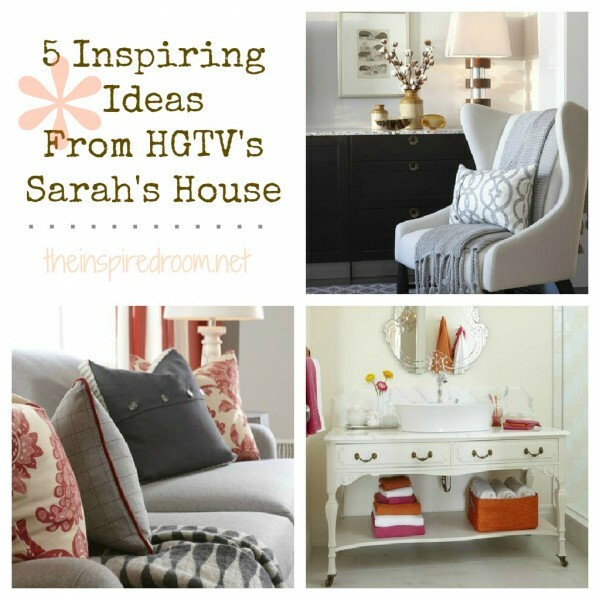 Which “Sarah’s House” take away idea is most inspiring to you right now? I’m as much in love with Sarah as you are I think. I wanted to throw my DVR out the window when I realized it only saved seven episodes of Sarah’s House and therefore deleted the first weekend of this latest batch before I could watch them all three time. My favorite Sarah’s house was the cottage by far, but I loved the concept behind this one: making builder standard not boring. I just think it’s so applicable to so many people these days. I think what I loved most was how she combined vintage items (like in the bathroom) with the new stuff to give that house character it never would have had otherwise. Also some of her ways of getting around “builder grade” were so creative. That vanity in the main bathroom? Wasn’t that amazing how she totally saved on the budget just by putting mirror panels in an otherwise pretty standard vanity? I truly draw more inspiration from Sarah than any other designer, and I’ve completely subscribed to her whole “jumping off point” idea, which usually comes in the form of a fabric. I had dvr drama too! Didn’t manage to get all the episodes, but DEVOURED the ones that did get saved IMMEDIATELY! We are buying a new home in 2013, and I am hoping that I can channel a. It of ms richardson’s style sense when it comes time to start decorating! OH, and thanks for the loving homage /post, Melissa – I am obviously here becz I enjoy reading YOUR thoughts on all this fun home stuff too! Just yesterday I was having fun designing a new sofa and chair-look, for my living/family room, on a furniture website. I think I’ll go back to the website today and play around with Sarah’s colors : ) The nice thing about this furniture website is you can save, whatever you design, on a Wish List. It will be nice having two or three looks to compare when it’s time to make a decision OR start all over again with another design completely different! Thank you Melissa for your blog. I cannot wait to open up your email each day to see what new ideas and projects you are creating! I’d love to see Sarah and Tommy tackle a project with a limited budget, I know it’s not Tommy’s style, haha, but it would be awesome to see her take on a budget decorating project!! LOV-ING that red and gray. I am so obsessed with gray right now – I can’t even take it haha. I also love that lvingroom storage! I can’t believe that is from ikea. I haven’t seen that episode yet, what did she use on the top of that piece? And were those kitchen cabinets or a stand alone chest that she customized? I’d love more details and can’t find a picture if it at closer up to investigate :) thanks for always being inspiring! They were kitchen cabinets topped with a counter! So awesome! I think the complaint that a lot of us who do or have lived in a brand-new home is that unless you get a custom built home, they can be really boring and totally devoid of any personality. So what is so inspiring to me about Sarah’s House is that I get ideas for making a brand-new “boring” house (although now that I’m living in an 80 yr old house I’d give anything for one of those “boring” houses!!) look special. I love all these tips that you showcased here! Thanks, yes it is a really fun show with great ideas for those of us who love a little more character and personality in our homes! I love, love, love Sarah Richardson’s take on design. And I’m so proud that she’s Canadian, so I can access many of her shows on the internet to watch over again. 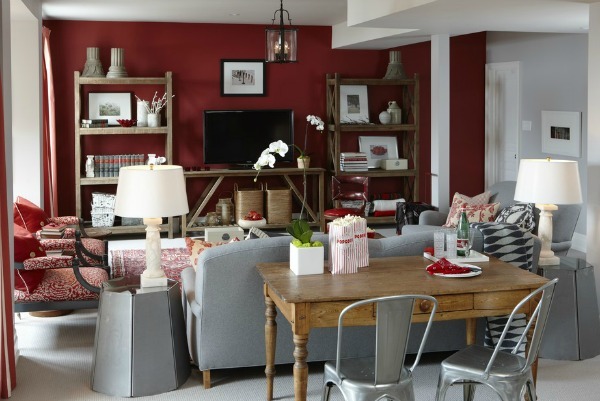 I love the mix of red and grey in that family room. So elegant, but so warm and welcoming at the same time. UGH! I love her so much it’s just silly. She is a MASTER of mixing fabric — loved these pics!! Thanks for this- I love Sarah’s House too but keep forgetting to DVR it!! I am most inspired by the way she puts fabrics together. 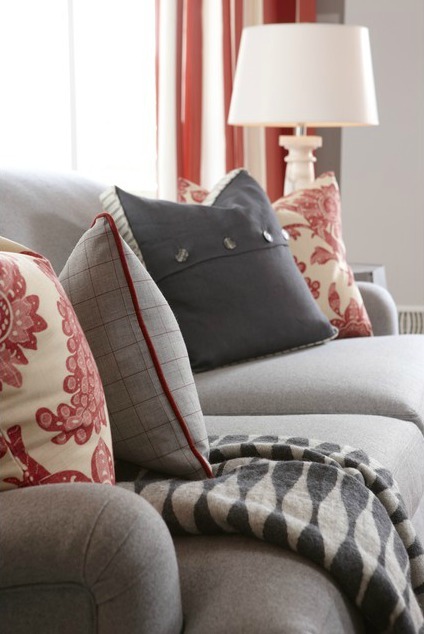 I love that she added red piping to the grey pillow so that it compliments the other pillows on the sofa. That is such a great way to ensure the pillows work together without “matching” too much. Sarah makes it look so easy! I watched the first marathon day of the new build, and loved that she made the living room one large room. I thought it was very smart, especially since there was a family room just around the corner adjacent to the kitchen. Her sidekick was too funny with his incredulous reaction to the builder’s kitchen budget. And she brought him back to earth by saying, “this is the world we are in.” Haha! I know, that was hysterical! I loved the humor of it and the fact that I’m scaling down their challenging budget to the world I live in!! So fun! I was just going to comment that Sarah makes it all look so easy. Looks like Christie beat me to it. I also love how she mixes IKEA with custom along with her wonderful mix of fabrics and her quirky, upbeat personality doesn’t hurt! I’m a big fan of Sarah’s House. Haven’t had time this year to watch any of the episodes. I’ll have to wait till the fall and watch them on Sundays. mmm … I don’t know a soul who has a $700,000 home or $100,000 to decorate with! Please keep an emphasis on simple and affordable ideas for all us real life people who love creating havens out of our living spaces. I’m at the very beginning of decorating our new home. This post was especially inspiring… Sometimes I get caught up in the “rules”… I am going right now to see when Sarah’s House is on next. Thanks so much for sharing this! What color grey are you using on your stairs & porch area’s?? We are waiting as I want to use that color on our inclosed porch!! Really LOVE grey right now. 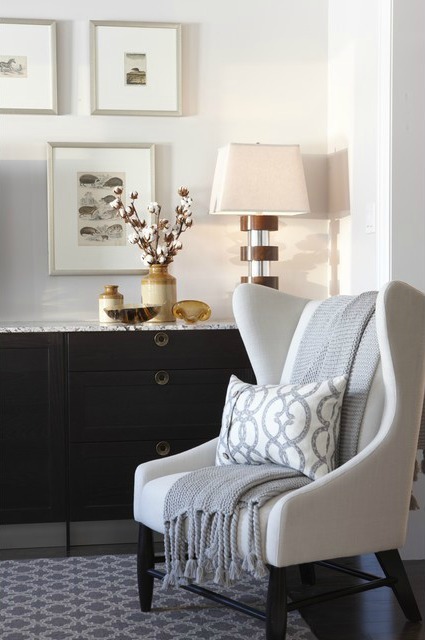 I want that chair, throw, pillow, ikea console, and lamp in my family room. I’m giving my current armchair the evil eye right now. Love. Love. Love. Sarah’s rooms! And red! What is it about it? Red rooms are so inviting. Oh…I went to the Sarah’s link to pin a room photo and I couldn’t find any of the photos you posted on the blog. Maybe I’m technically challenged???? I must have,need,want,desire that huge gorgeous mirror in the bathroom! I enjoyed the shows of Sarah’s house on the island! Help! I can’t find the episodes on our Comcast Infinity guide. We get HGTV but Sarah’s House isn’t listed anywhere, just a “Sarah 101” from 2011. I live in Bellevue, WA. Thanks for posting the pictures, but I’d love to watch the episodes, too. I love the idea of using a piece of furniture in an unexpected way, like a bathroom. I’ve recently seen a few kitchens that have used furniture pieces instead of typical cabinetry with stunning effect. Melissa–I couldn’t agree with you more about Sarah’s designs. I absolutely love how she blends old and new to create truly timeless spaces. I had a rainy day off earlier this week and I watched the entire series on my DVR!! My favorite space she did was the master bedroom inspired by the antique pressed botanicals. My husband and I are currently looking at buying a (14 year old) builder home, and I am certainly going to be checking out a few of the architectural salvage places in my area for some unique ways to spice the place up (as Sarah did in the master with the Roman columns). I totally agree, especially #1. I like using different woods and color together, it adds interest and character. And it feels like me. I love Sarah’s House too, but sometimes I find her rooms very busy! My eyes can’t rest. That said, I love watching her creative process as well as her relationship with Tommy and her crew. I love these ideas and rooms! Too bad that we don’t have that show in Germany, it would really be something for me! I also only got the last episodes from the boys room on and yet, HGTV shows 29,000,000 episodes of House Hunters and can’t repeat Sarah’s House once! (My family says I am prone to number exaggeration but in this case, I think not!) I loved these episodes. While I agree her budget is over the top, I tend to take a room at a time and take snippets of ideas from each room. I do wish they had made the distinction more between what were actual house upgrades vs. the decorating budget. She usually makes a good chart listing her expenditures and I wish she had done more of that throughout the episodes. I saw that for the bedroom addition and the basement but not the other ones. I love her style and her ability to pull it all together. Can’t get enough of Sarah! I agree with your House Hunters statement, 100%. I’ve pretty much stopped watching HGTV, except for Sarah of course. What is the name of the paint color in the bathroom retreat?